Back in Erie for a family wedding. 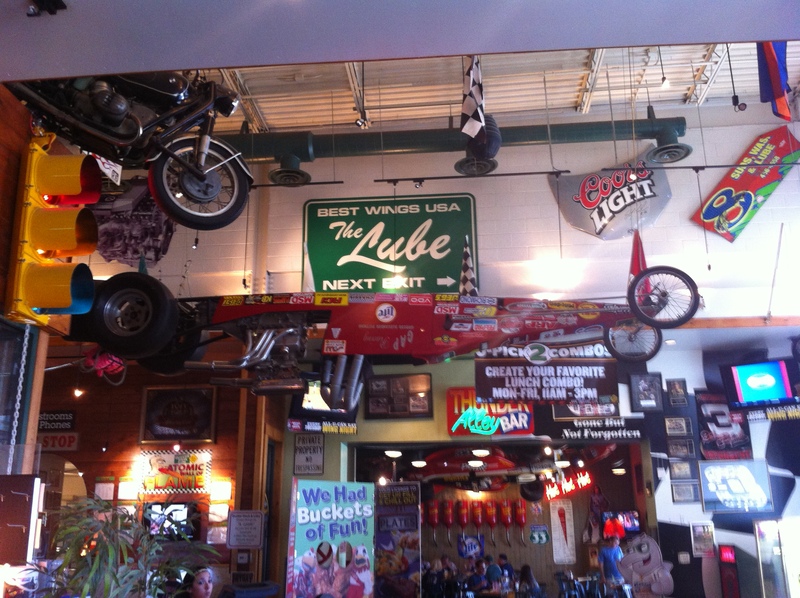 This region of Pennsylvania is known for its Buffalo wings, and this region is home to one of the best and biggest wing spots: Quaker Steak & Lube. To Buffalo wing fanatics, Quaker Steak & Lube (often referred to affectionately as “the Lube”) needs no introduction. This restaurant powerhouse started in Sharon, Pennsylvania and is now famous for its list of sauces and its speedway atmosphere. The staff at every single Lube location I’ve visited has been nice and professional, the restaurants are always clean and running efficiently – like a well-oiled machine, one might say. I had my first experience at the Lube during college, when Tuesdays were All-You-Can-Eat Night. In those days, Tuesday night wing-night could go on for hours and I easily wolfed down a few dozen wings of varying sauces. One of the Lube’s landmark sauces is the Atomic sauce. It’s a habanero hot sauce that actually deserves the waiver some locations still ask their patrons to sign before they can try Atomic wings. 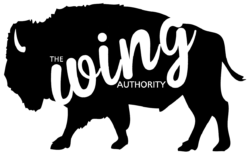 The Wing Authority actually finds it quite tasty. An Atomic wing experience is deliciously, frightfully intense – the wing-lover’s rollercoaster. 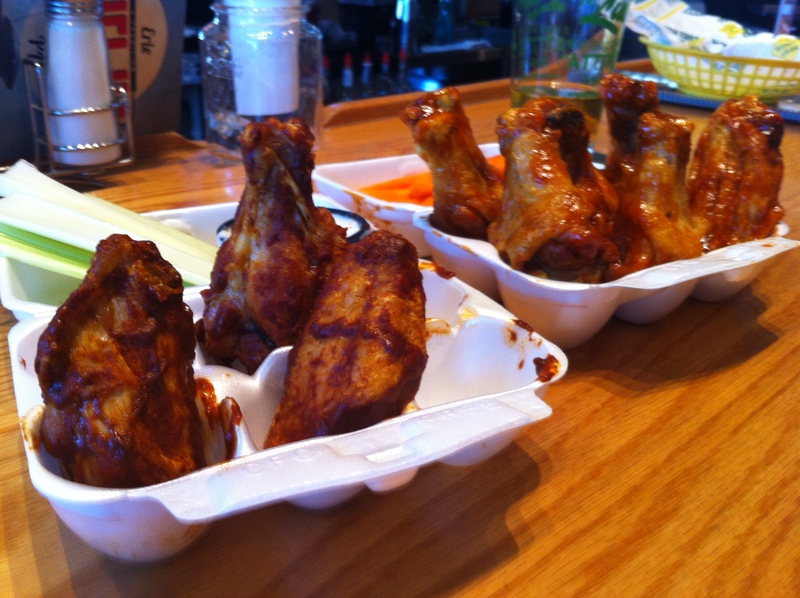 Atomic wings are no lightweight endeavor. 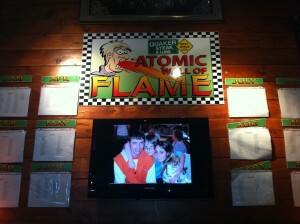 This time, as I turned to seat myself at the bar, I came upon the face of the Atomic challenge itself. One of the walls sported the “ATOMIC WALL OF FLAME“. There was no question that I’d have to satisfy my craving on this trip back to northwestern PA and get a quick fix of Atomic sauce, but this day was no day for a full-scale challenge. We were simply having an appetizer for the road because dinner was later. Sometimes it’s time to get sweaty, panting, bloodshot eyes bulging and sucking your own fingers, and sometimes it isn’t. The Wing Authority saddled up to the bar and ordered a couple of sample sizes. These wings are super hot. They’ve got that unique, smoky, habanero flavor, peppery and rich, and the wings are always layered with this thick sauce. Naturally, celery and blue cheese help keep things relatively under control, but beginners are going to want a glass of milk for this ride. One might point out that Atomic sauce, along with many other flavors appearing on the Quaker Steak menu are not Buffalo. It’s true. Atomic and other habanero sauces really walk a fine line between being Buffalo or not Buffalo. It depends on the recipe. Many habanero sauces will include some red hot sauce and some butter in order to round out the bitter taste some habanero sauces can have. Even the Louisiana Lickers, while presenting a strong barbecue flavor, brings plenty of Buffalo flavor and that sauce is therefore totally Buffalo. Those are Louisiana Lickers on the right, another of Quaker Steak’s brilliant creations. Needless to say, after just a few Atomic wings, we had a bit of panting and sweating going on. But, man – it’s always worth it! Long live the Atomic wing! Just a quick note: there is no apostrophe in this restaurant’s name. My last time eating at Ruby Tuesday was years ago and – as you know – this restaurant can be found in every big city and little town across America. My memory was that this was a place that paid some attention to its chicken wings. I especially recalled the jalapeno slices sitting on top of the wings, covered by a thick, spicy Buffalo sauce. Due to those factors, it was obvious that The Wing Authority was going to have to refresh his memory. On this sunny Sunday, my wings were served by a cheerful female server with blue cheese and celery and with the jalapeno slices that I remembered so distinctly. According to the menu, these were to “cool the palate.” Have no fear. 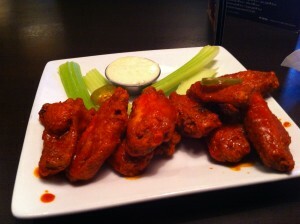 The Wing Authority can tell you these wings will not make you pant and run for the nearest glass of milk. These wings are tasty! As you can see, they’re tossed generously in that perfectly viscous sauce and plated beautifully. They were crispy (maybe fried even slightly TOO crispy), juicy, and a good size. 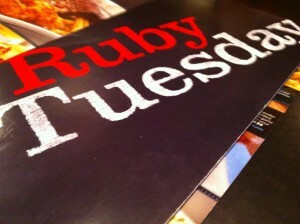 Ruby Tuesday’s wings are well-known. While eating Buffalo wings next door to the Macy’s in your local shopping mall might not be the first choice for true Buffalo wing fanatics, it’s a good fall-back choice when stuck in an unfamiliar town and the craving hits, or when you’re forced to spend an afternoon in a shopping mall and need something to look forward to. The fact is, Ruby Tuesday’s wings are definitely Buffalo.